We were so saddened to hear this morning of the death of Chester County Department of Emergency Services Director Colonel Ed Atkins. We send our deepest condolences to his family and the entire Chester County community. The Red Cross and Colonel Atkins were great partners and worked closely to not only respond to disasters large and small in Chester County, but also to prevent disasters from happening in the first place. Atkins’ leadership during the recent flooding and the February ice storm was instrumental to keeping citizens safe and informed. It wasn’t that long ago that Colonel Atkins was delivering the keynote address at our Chester County Heroes Breakfast. His deep concern for the county and his deep appreciation for the Red Cross was powerful and clear. That was a sentiment echoed by everyone around the office today and in the field. One person who worked very closely with Ed and his team is our volunteer Chester County disaster action team captain, Denise Graf. 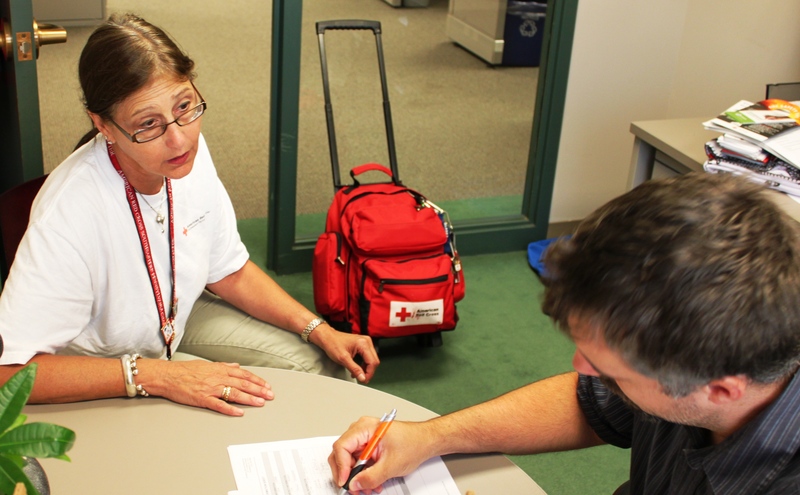 She is the one making sure the needs of the county and the requests of the emergency services team are met during disasters. I didn’t really start using Twitter until being deployed with the Red Cross to the Boston Marathon disaster a year ago. I was never a fan. Now, it’s not only part of my day but a large part of my response to disasters. This weekend I was a #DigiVol (Digitally Deployed Volunteer) for the @Redcross (American Red Cross). We were 1,200 miles away from the disaster zone, but still helping to make a difference. It was a short but wild adventure. 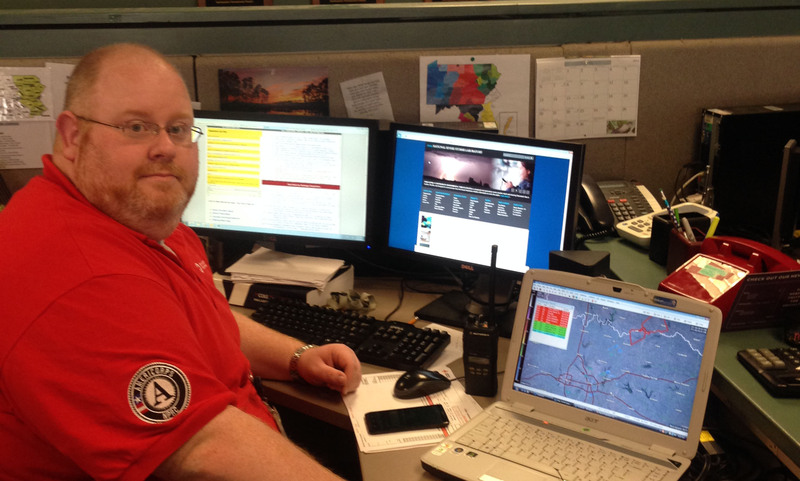 As tornadoes and thunderstorms bore down on the Midwest, our job was to take to social media and promote preparedness and safety. Our intention was to engage people to help calm and guide them. For my shift, I was handed the keys to @RedcrossNETexas (The Official Twitter of NE Texas and SW Arkansas) and sent out on my mission. 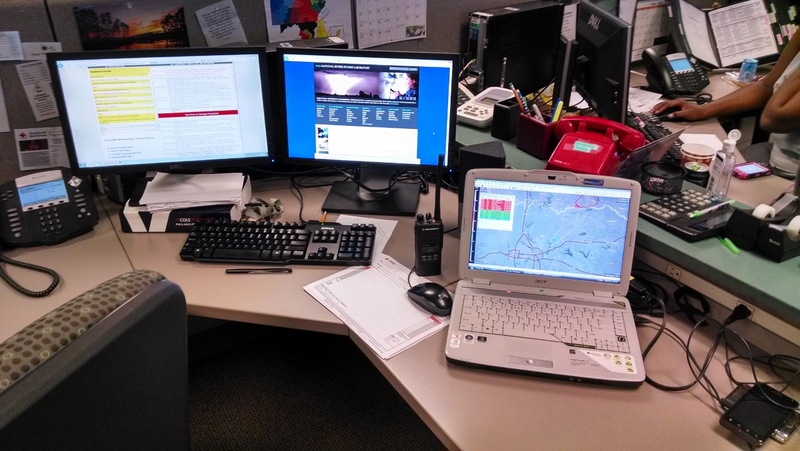 Watching weather radar, media outlets, and other posts from tornado chasers, I promoted the Red Cross Tornado App and gave tips on how to prepare and respond to the storm. My partners for the day, @Telesara (Sara Smith) and @Mindy_Hart (Mindy Hart) were also from Philadelphia. I went for quite a spin around the block with the account. Hashtags — symbols placed in front of a word to help Twitter organize different topics — were flying. Some were obvious… #helpme, #scared, #missing, #disaster, and some were not. For example, #NoRotation came to designate clouds not moving in a twisting funnel. We engaged scared people by telling them it was alright to be scared and guiding them on what to do next. All the while, we watched the destruction start to hit national news. It’s a very scary, hopeless feeling. You just want to do more. At the end of the shift, Sara and I guided a young middle school student on how to find her uncle amidst a destroyed town using #safeandwell, the Red Cross database to help let loved ones know you are okay. Later, I was listening to a storm chaser on a radio feed talking to the National Weather Service (NWS) in Little Rock, AR. He was with a pastor from the Antioch Baptist Church in Conway, AR. They were opening a shelter there to provide immediate cover for victims who had just lost their homes. Another round of bad weather was on the way. The phones were down and they couldn’t get in touch with the Red Cross. They needed our help. The NWS wasn’t able to get in touch with Red Cross yet either. I told Sara what I’d heard. She said she saw the Red Cross communicator near Conway online. I gave her all the information, and we relayed it to Arkansas from Philly. A few minutes later, a Handheld Amateur Radio Operator (HAM) with our team in Arkansas was on the air advising people in Conway that they’d gotten the message and were sending them Red Cross teams and supplies. We had made a difference to immediate disaster victims from 1,200 miles away. Now, a day later, the Digital Volunteers of @RedCrossPhilly are still watching over the people of the Midwest. We stand ready, waiting to respond, to help them recover, using the best communications methods at our disposal. In person, at the scene of the disaster, or in the virtual world of cyberspace, our mission remains the same: Help alleviate the suffering of victims of disaster. The American Red Cross Southeastern Pennsylvania has its volunteers on standby and has established shelter team in the event sheltering is needed due to the ongoing snow storm. But as of 5:30 pm 2/13, that has NOT been necessary. Staff and volunteers are staffing any open county and city Emergency Operation Centers and equipment has been prepositioned throughout the area to respond to any requests for assistance or sheltering. If shelters do open, they will be listed below by county. Information will also include an address and if the shelter is pet friendly. You can also follow updates on twitter, by following @redcrossphilly @telesara and @dcschrader. And if you need your sidewalk or driveway shoveled Friday morning, let Uber Philly do the work. And all proceeds will benefit Red Cross disaster relief. Please keep these safety tips in mind if you do lose power during the storm. Here are some tips to be safe during a winter storm. Don’t forget about your pets, here are safety tips for your pets during a winter storm. And, here are tips about preventing and thawing frozen pipes. Thank you and keep warm. Careers should be chosen by interests instead of salaries. Although income is a determining factor when deciding on what career to go into, ultimately, I feel that most important factor when deciding on which career to follow is if you truly enjoy the work. For me, the only way I can see myself enjoying my career is if it gives me the opportunity to directly help others and the American Red Cross has allowed me to do this during my time with them as an AmeriCorps National Preparedness and Response Corps member. 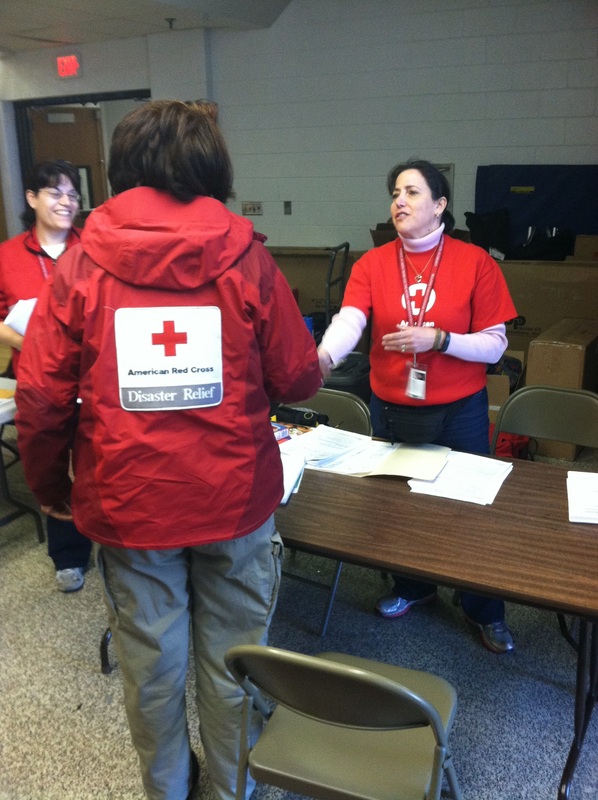 As an AmeriCorps NPRC member, our main responsibility is to go on disaster responses throughout Southeastern Pennsylvania and provide assistance to families that are affected. For Southeastern Pennsylvania, most of the disasters we respond to are fires and we usually approach the disaster right after it occurs. When I encounter clients, they’re usually distraught and scared for what their future holds, but after speaking with them and providing them assistance, I quickly see their emotions change from relief and joy. It’s this change in emotion that motivates me to get up every morning and commute over an hour to come into work. Working with those affected by disasters is a rewarding experience and makes my time with American Red Cross truly meaningful. Today (January 16, 2014) is a very exciting day for the American Red Cross. 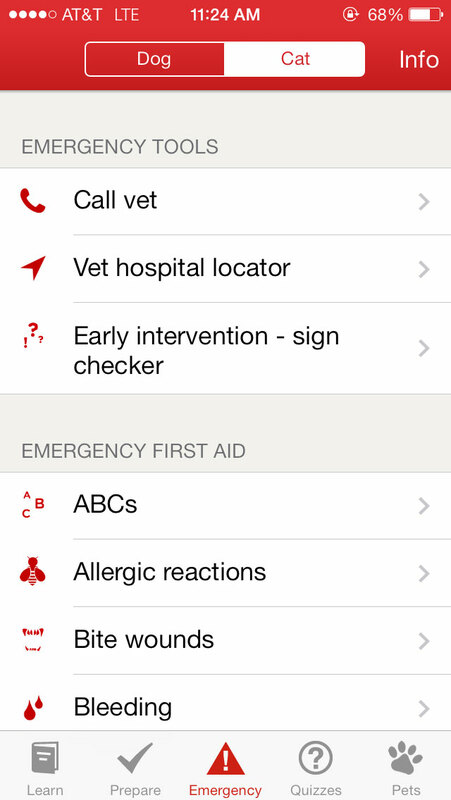 It launched its Pet First Aid App for iPhone and Android. 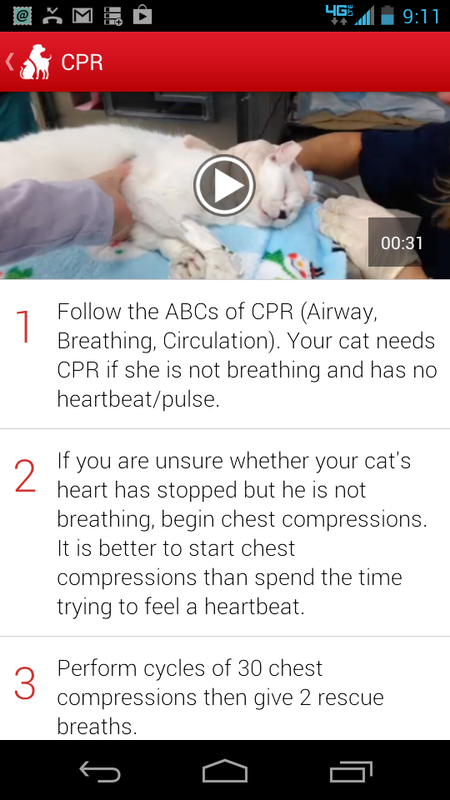 It is particularly exciting for the American Red Cross Southeastern Pennsylvania because the content and information in the app was provided by Dr. Debbie Mandell, an emergency room veterinarian at the Ryan Veterinary Hospital at the University of Pennsylvania here in Philadelphia. Dr. Mandell also serves as a pet advisor to the American Red Cross. In order to launch the app, the Red Cross held what’s called a Satellite Media Tour at a studio in Philadelphia, featuring Dr. Mandell, a Red Cross national spokesperson, two pet first-aid CPR manikins, and Mana, the best behaved dog ever known to attend a media event. Basically, TV and radio stations across the country did interviews with them, one after the other. I got to work on this project because of my position with the Red Cross here in Philadelphia. We did site surveys at Penn Vet’s ER, but we couldn’t logistically work out a way to showcase pet emergency care; the unpredictability of a pet emergency room could make for great TV or awful TV. We couldn’t take the chance on the latter. 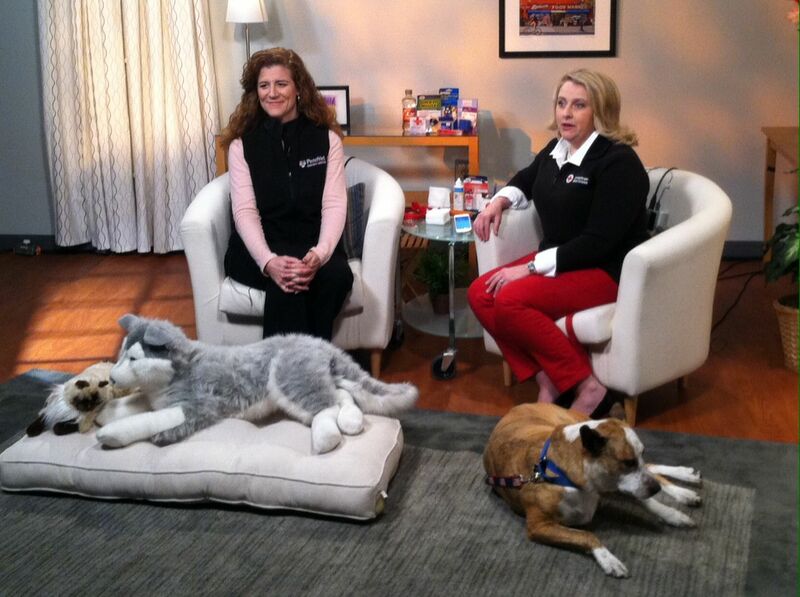 Dr. Debbie Mandell (L) of Penn Vet and Laura Howe of the American Red Cross, and Mana the dog, during media interviews about Red Cross Pet First-Aid app. So for about six hours this morning, Dr. Mandell, the spokesperson, and Mana sat in a studio saying the same things over and over about the Pet First-Aid app. 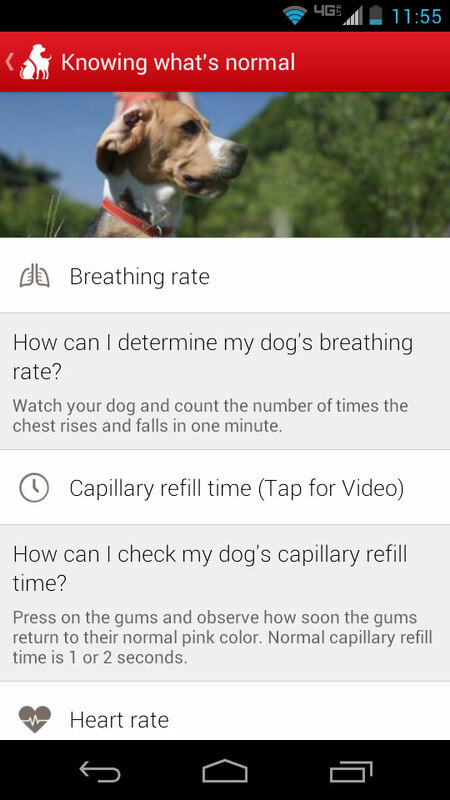 They explained for what seemed like a thousand times, the app’s many features, did pet CRP demonstrations, and showed what items should be in every family’s pet first-aid kit. One thing in particular stands out to me from the series of interviews this morning. Dr. Mandell really did a geat job emphasizing the dangers in your home that you may not be aware of. She mentioned certain plants and flowers are toxic to cats and dogs. I had no idea. The Red Cross Pet First-Aid app identifies those plants for you and what to do if your pet eats or licks any of those plants. My two dogs died a few years ago, so I don’t have any pets, but I can still use the app. It is useful for me to help potential Red Cross clients with pets, who need a place to go after a fire or flood, find nearby pet friendly hotels. Often, concern about what to do with their pets prevents people from evacuating. This app helps alleviate those concerns. Jen Leary, who runs the local pet disaster rescue organization Red Paw, downloaded the app and says the pet friendly hotel and vet locator portion of the Red Cross app is a “game changer” for her volunteers in the field. But if you have a pet, you definitely need to consider downloading it. The 99 cents seems like a small price to pay for an app that has so many great, potentially lifesaving features. Plus the 99 cents goes to support all Red Cross services, including disaster relief. To do that go to redcross.org/mobileapps or search Red Cross on iTunes or Google Play. And help ensure you’re prepared to care for you pets like any other member of your family. Super Storm Sandy arrived for me actually a few days prior to the storm. I was busy preparing my family for the brunt of the storm. I knew that I would not be home with my family during for the storm. I knew that I would be busy doing something for the Red Cross. I had know idea what that busy was, I just knew what that I would be busy, in fact very busy. The phone rang and the caller ID announced that SEPA was calling. So, I picked up the phone and Leo Pratte, Director of Emergency Services was on the other end. He proceeded to ask if I would accept the managers position for Disaster Assessment (DA) for the Chapter. He told me to be prepared to leave, and that I would be staying at HQ for the duration and aftermath of the storm. Wow, was I excited and extremely nervous at the same to time. Leo told me be at Chapter Sunday morning before the storm hit on Monday. So, I ran around like crazy buying this and that. I needed to know that my family was prepared for the storm so that I could feel good about leaving my loved ones at home without me. Ok SEPA… ready or not here I come. After all, I had prepared myself for this, taking class after class and having had the knowledge and practical experience from my many many National Deployments! I worked very long hours, slept at chapter on a cot, spent many nights sleeping at the Red Cross House, typed reports and sent my DA Teams out to hit the streets of our five counties. I was so thankful for Leo having the confidence in me and allowing me the privilege of leading a team of wonderful volunteers. They gave their time and left their families to volunteer with SEPA andserve their communities. This was an amazing experience for me and one that I will not forget. Thank you, Leo and thank you Red Cross for the opportunity to serve! Take heed, everyone! The American Red Cross has a new App for your mobile devices, and it is awesome in its power and scope. 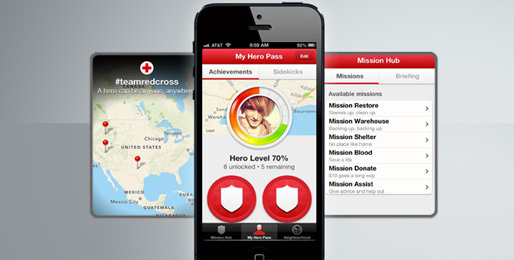 On July 18, 2013, the Team Red Cross App will be available for download at your friendly neighborhood App store, and, if you are serious about helping your fellow humans, you should download it immediately. Although, I’m sort of old school when it comes to social networking stuff (when I was a whippersnapper, the internet was for guys in thick glasses sitting by enormous mainframes), I am really impressed by potential for the Team Red Cross App to harness the power of volunteers. Recently, when tornadoes hit south of Oklahoma City, thousands of local residents contacted the Red Cross to ask how they could help. In the future, people in the area of a serious disaster will be able to download the Team Red Cross App onto their devices and use it to learn exactly how they can help. The app will provide short orientations for those who are willing to help stock warehouses, move supplies, set up cots, serve food in shelters and otherwise support those who were driven from their homes by a disaster. In addition, the app will link volunteers to other opportunities to serve elsewhere or in the future and inform volunteers about First Aid classes they could take to expand their skill base. Sounds good, right? Well, here’s why this app is a fantastic development. It will allow users to share their involvement with the Red Cross through their own social networks and thereby act as ambassadors for Red Cross volunteerism in their communities. We know that people are influenced by the activities and interests of their friends, and if a person you care about passes on information about how easy it is to volunteer, you may be moved to do their same. Users will be able to earn badges on the app as they learn more and do more for others. And it’s from this pool of committed people that the American Red Cross will be able to recruit long term volunteers, encourage blood donations in high need areas, and even give people the opportunity to donate money. Even if they can’t volunteer, app users will be able to share preparedness information and content with those affected by a disastrous event. Finally, it will give the media, which is often inundated with requests for how individuals can help in the wake of a serious event, a place to send people for information. 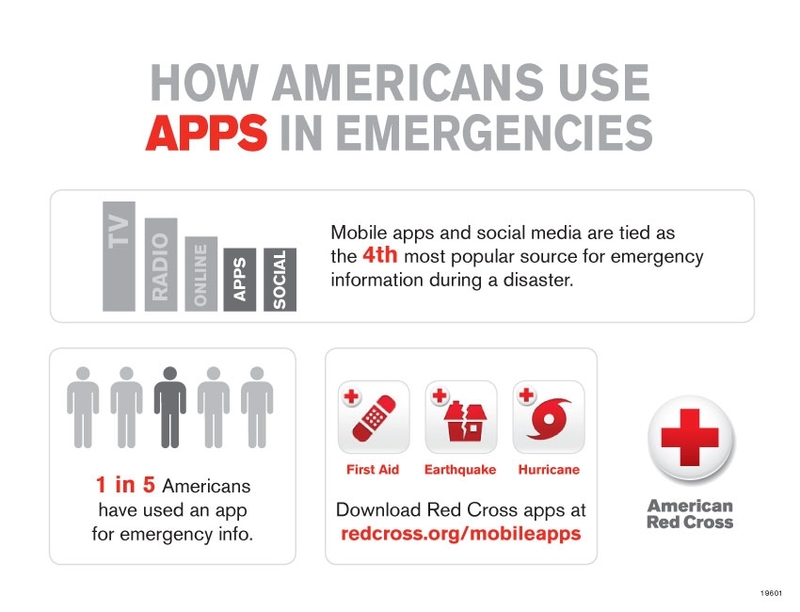 Over one fifth of Americans have already used an American Red Cross App (for hurricanes, tornadoes or earthquakes) on their mobile device. In our busy lives, we are not always near a television or radio, but many of us own a smartphone or tablet from which we can access the information we need to prepare ourselves and to help others. So please, go to the App Store immediately and download the Team Red Cross App. It’s free! Tell your friends. Help spread the word. Be an ambassador for the most efficient way to fight disaster since the invention of the water hose. The Red Cross needs you.